Try a leather dog collar with nappa lining, braids and brass medals. Sizes: 18-36 in. Colors: black, brown, tan. Colors of lining: black and tan. Choose a strong and beautiful dog collar for your large dog. Your big mastiff will like its softness and pleasant to touch inner lining. Our specialists have created an incredibly strong and at the same time elegant dog collar for big dogs like mastiff. It will fit for strong, medium and big dog breeds. 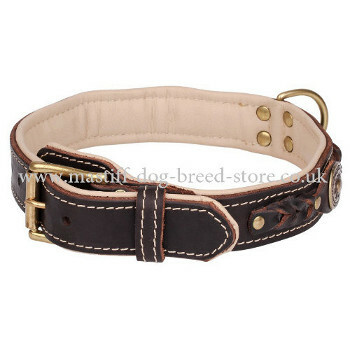 Thick leather dog collar is professionally handmade, well-done, reliably riveted and stitched. Every single detail is carefully fixed to make this luxury dog collar extremely durable and perfect-looking for many years.